BowFlex TC100 TreadClimber Review by Industry Experts! The BowFlex TC100 TreadClimber offers the benefits of the TreadClimber design and engineering at a reasonable price – typically around $2,000. The higher model Bowflex TC200 can get a bit pricey at around $3,000. BowFlex TreadClimber are probably the most popular cardio brand machines in the industry. Literally tens of thousands have been sold, and the feedback that we get is that the majority of buyers are satisfied customers. In addition, the TC100 is very efficient in helping users lose weight and get in shape. We recently spoke with the some of the top Bowflex engineers to hear about this recent Treadclimber model. 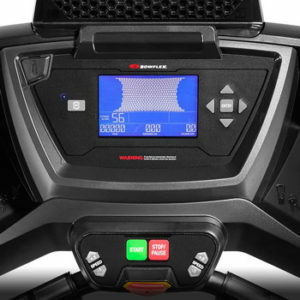 Mid Week Sale Ends Thursday: Use the Promo Code on the Bowflex Website to SaveUse Code “TAX2019” for $300 OFF and Free Shipping on the TC100! Low Impact Workout – The unique design of the TreadClimber allows the user to burn serious calories with a low impact workout. There is much less impact than running on a treadmill. It is about equivalent to the impact of an elliptical trainer. 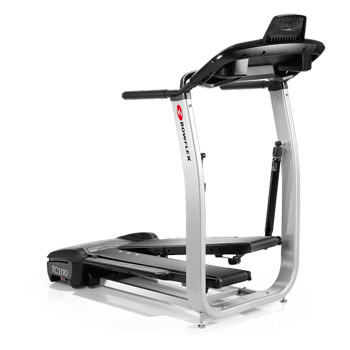 The BowFlex TC100 is design with two treadles, which are sort of like mini treadmills. Each treadle lifts and rises to meet the user’s foot. This significantly reduces the impact to your lower joints. In comparison, when you run the impact can be as much as 2.5 times your body weight and can affect not only your lower joints, but also you back. During our last interview with Bowflex designers, they told us that walking on a Bowflex Treadclimber is a bit like walking in sand on the beach. It takes more effort to provide a more effective workout. The BowFlex TC100 TreadClimber gets high marks for providing an intense cardio workout with very low stress and strain to your joints. It is designed only for walking and is not recommended for running. But once again you get the same results from walking as you would with jogging or running. Compact Design – For those that have unlimited space for your fitness equipment this will not be an issue, but for those that have space constraints, the TC100 can be the solution. The TC100 has a length of 50.6”. In comparing an elliptical trainer like the Sole E95 has a length of 83”, and the compact design of the TC100 does not compromise the stability. Calorie Burn “Game” – The designers at Bowflex are always looking for fun ways to motivate their customers. On the Treadclimber TC100, they incorporated a sort of game with 500 digital dots on the console display. You can see the dots disappear as the calories melt away. This display looks a bit like the popular Candy Crush game. Warranty – The parts warranty is subpar at 2-years, but the 2-year labor warranty is typical for this price range. 3-in1 Technology – The TreadClimber claims to combine the benefits of a treadmill, stair climber and elliptical. We would agree to most of the following assumptions. The unique design has the benefits of walking, jogging and running on a treadmill. In addition to engaging your legs and glutes, the uphill motion engages your core muscles. You get the intense cardio workout of a stair climber. 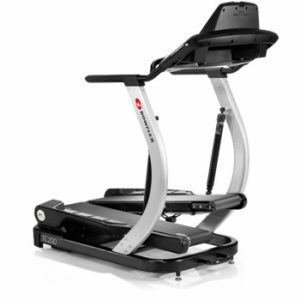 With the treadles rising to meet your feet the low impact is similar to an elliptical trainer. 3X More Efficient Than a Treadmill – This claim is based on comparing apples to oranges. They base it on the treadmill being level and walking on it. If you increase the incline and jog or rung you will get a similar cardio burn. Also, achieving your fitness goals in just 30 minutes 3 times a week is a push. Other factors need to be taken into consideration like diet, upper body workout and overall lifestyle. Bowflex Treadclimber TC200 with Bluetooth Compatibility and Fitness Tracking – Read our full review. The number of BowFlex TC100 TreadClimbers sold and the high percentage of satisfied customers is the biggest endorsement of this cardio machine. The combination of low impact workout and compact design are what makes the TC100 appealing. That said, the BowFlex Treadclimber TC 100 does not offer very much in the way of interactive and motivational technology. If you’re interested in more capability, definitely check out the Treadclimber TC200. It has enhanced Bluetooth Compatibility and syncs with Bowflex’s free fitness tracking app! As mentioned, BowFlex makes some exaggerated claims as to the results you will achieve, but that is typical of and fitness equipment manufacturer. Overall, we give the BowFlex TC100 high marks for a unique design that allows you to burn calories and lose weight without beating up your body.